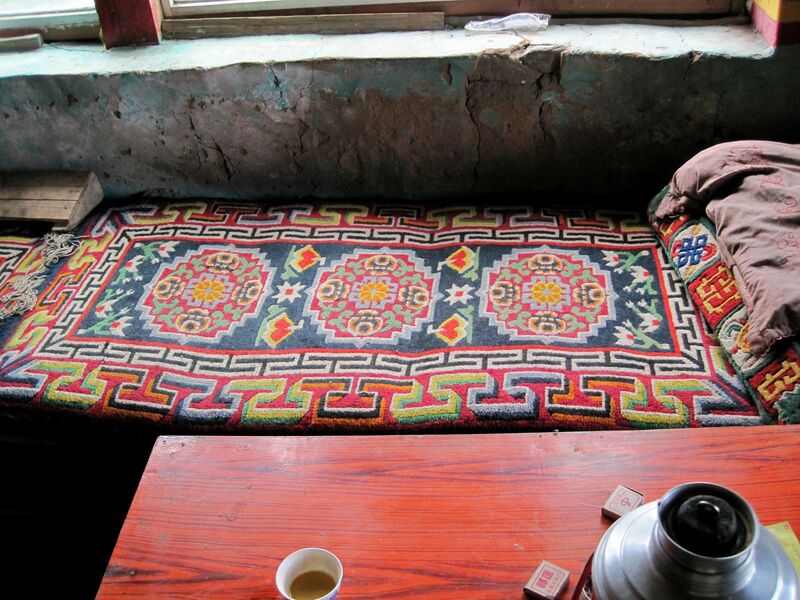 Tibetan family invites you inside of the stone-built house somewhere in the cold-desert plateau near Himalayan Range. 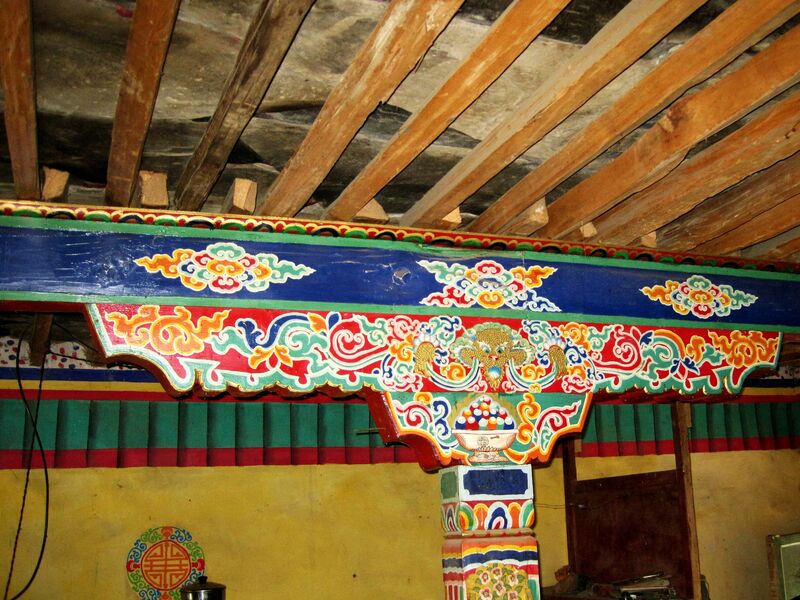 You will see artistically painted furniture, sun-cooker, yaks’ manure as a fuel and more…. Paying the visit to a Tibetan family. Visit to any foreign country, especially to the one so distinct in terms of culture, traditions and lifestyle will not be complete without making an unannounced stop at a private house. Having this idea in mind we asked our guide for permission to pay quick visit to a Tibetan family in one of the houses we were passing by. The remote area of the Tibetan plateau, off the beaten path, far from modern trends already taking roots along the Friendship Highway seemed to be a good choice to get in touch with an authentic Tibetan life and its hardship. From the outside these stone-built houses look very solid. They are often surrounded by high walled backyards – probably serving as open-air “stables”, storage for piles of dried yaks’ manure, sun-dryers for freshly collected manure “glued” to the walls and obviously for "everything else". 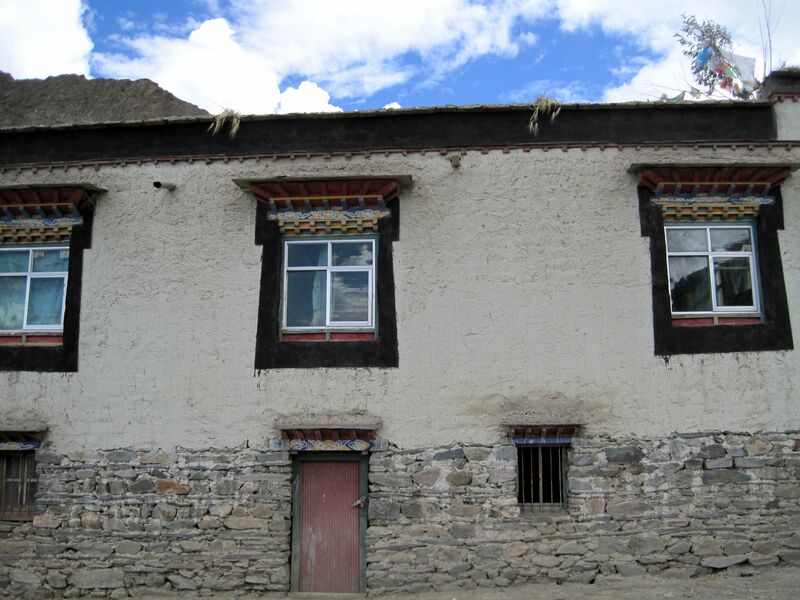 Stone-built house in the heart of the Tibetan Plateau. Insides are very modestly equipped with all you may imagine is necessary in so harsh environment. Beds along the walls neatly covered with colorful hand-made rugs make most of the furniture in the “multipurpose room” serving as kitchen, bedroom and living room at the same time. It’s a necessary compromise in the place with no heating system and scarce fuel (dried manure). Few wooden shelves display unpretentious kitchen stuff. Small internal iron stove seems to be used only winter time for cooking and heating. Outside in an open air area there is another stove used for little daily cooking. Solar cooker play similar role as a microwave in our kitchens - defrosting and warming-up meals. Understandably with this kind of fuel, cooking outside may be a wise decision. 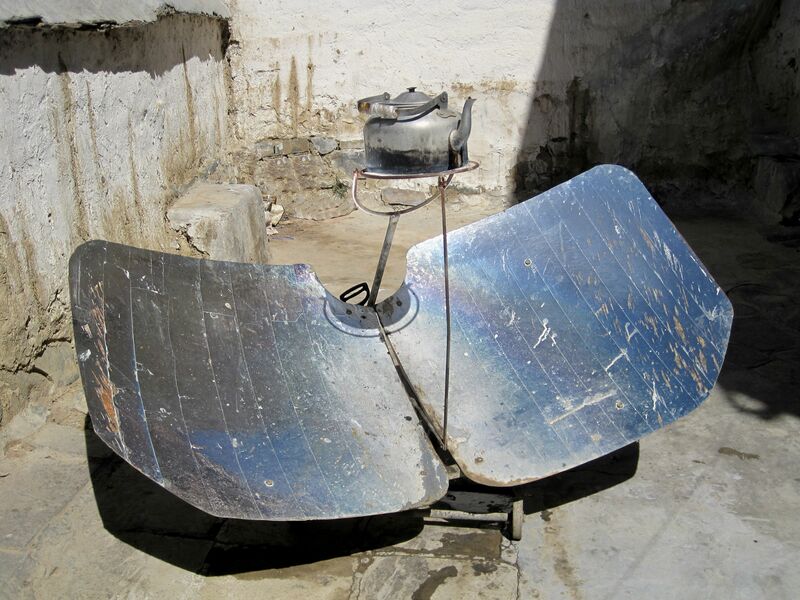 Next to the external iron stove there is another smart invention for fuel deprived areas – a solar cooker. Two parabolic metallic mirrors concentrate the solar energy in the spot where the tea-pot is placed. I doubt you can boil the water this way (although at this altitude due to the low atmospheric pressure the boiling temperature is much lower than our typical 212 F (100 degC). But it may be perfect device to warm up water and meals, even during the winter time. Multipurpose room serves as bedroom, kitchen, dining and living room. In contrast to this plain and simple furnishing and amenities, few cabinets and sideboards clearly distinguish themselves with beautifully colorful hand-made ornamentation. May be I should say it differently – Well, exactly right here, in the middle of nowhere these pieces of art bear witness to the high spirit of Tibetan people…. Here, high on the Tibetan plateau, human esthetic needs cannot be filled with colorful pots of flowers suspended at the windows of our houses, nor neatly cut grass at the backyard. Tibetans found another way to express themselves, to express their "joie de vivre"…. TV and few other electrical items like radio, power supply and sort of electrical tea-pot or coffee maker make short list of “high-tech” devices…. Ceilings point to another unfamiliar structure. Long wooden beams (obviously a real treasury in this treeless environment) support the roof made from layers of flat pieces of rock. From outside they are probably patched with small stones, clay, moss and frankly - God knows what. Obviously on this side of the Himalayan Range the “wet season” is dry, but still at some time the snow melts down and roof must prevent water from leaking through. Wooden beams seem to be in good shape without any trace of leaks once again confirming human ingenuity. On the roof a bunch of prayer flags dancing and jumping in gusts of wind endlessly whisper Buddhist prayers….. Here, on the top of the World’s Roof, surrounded by pristine nature, words of prayers mixed only with the sound of wind fly high possibly finding an easy way to the nearby heaven…..